Be the first to share your favorite memory, photo or story of Velma . This memorial page is dedicated for family, friends and future generations to celebrate the life of their loved one. 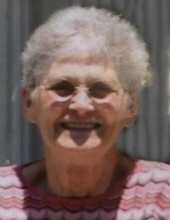 Velma Wylie Beatty, 88 widow of James (BI) Beatty, died December 2, 2018. She was the daughter of the late Ethel Hay and Henry Wylie. She retired from ARH. She was a Kentucky Colonel and a member of Gardenside Baptist Church. Survivors include son, Gary (Barbara) Beatty, daughter, Karen Beatty (Billy Treadway); grandsons, Jathan Laney, Stephen, Eric, and Alan Beatty; one brother, Bernard (Janis) Wylie, special cousin, Denton Willis, and her sweet nieces and nephews. She was pre-deceased by grandson, Aubrey Laney and brothers, Glendell Wylie and Bobby Wylie. To send flowers or a remembrance gift to the family of Velma Wylie Beatty, please visit our Tribute Store. "Email Address" would like to share the life celebration of Velma Wylie Beatty. Click on the "link" to go to share a favorite memory or leave a condolence message for the family.